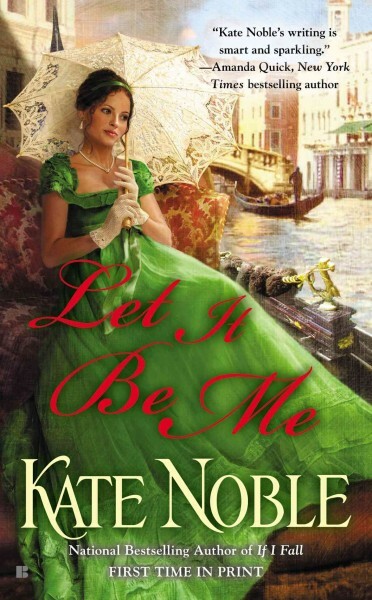 Let it Be Me is the enchanting new romance from author, Kate Noble. It tells the story of Bridget Forrester, a gifted pianist, who is, unfortunately, plagued by a terrible case of stage fright and insecurity about her abilities, and Oliver Merrick, a man with a gift for discerning people’s talents and nurturing them. Bridget, frustrated by the roaring success of her sister’s social debut compared with her own lackluster first season, has been declared a shrew and her “character fixed as ‘unpleasant.’ And there seemed little she could do but endure it.” Until, that is, she receives a letter from the famed Italian composer, Vincenzo Carpenini, inviting her to become his student when he returns to England for an extended stay. Bridget is elated. Finally, proof of her own worth! But after finding out that Carpenini has suddenly changed his mind and no longer plans to leave Venice, she is heartbroken and humiliated. However, not one to simply accept defeat–at least when it comes to her heart’s desire–and assisted by the convenient collapse of a tree on her family’s townhouse, Bridget manages to persuade her mother, together with her younger sister, to decamp for Venice and warmer climes. When she arrives in Venice for her long-awaited music lessons, she is stunned to discover that the composer does not remember her at all. But Oliver, Carpenini’s friend and supporter does; and since Carpenini has foolishly risked both his career and Oliver’s with a wager against the Austrian composer Klein–the new favorite of the Marchese–Bridget’s sudden appearance is well-timed. The blossoming relationship between Bridget and Oliver is lovely to read about. As Bridget’s passion for life and love flourishes, so does her ability on the piano. Oliver is unlike any other romantic hero I’ve ever encountered. Very much a beta, he supports and encourages Bridget, and believes in her in a way no-one else has. His character has a good natured temperament and a gentle sense of humor–somewhat refreshing after the big, bad alphas, who seem to get riled up over nothing. Noble’s writing is lyrical and filled with musical metaphors and similes. Framing the relationship in terms of music was an enjoyable novelty. I particularly liked reading a historical romance set somewhere other than Britain or America, and I’ll admit I’m partial to the romantic setting of Venice. For those seeking a well-written, touching romance with a hero and heroine worth cheering for, I highly recommend Let it Be Me. Meet the Roman Julio-Claudian dynasty of I, Claudius – the original dysfunctional family – and get ready for a history lesson unlike any you’ve ever had. I, Claudius is one of the most beloved miniseries ever made and is a wonderful, blackly funny dramatization of the Robert Graves’ novel of the same name. It tells the story of the Roman Empire from the reign of the first emperor Augustus – a reign that brought a longed-for period of peace after over a hundred years of on-and-off civil wars – right up to the rule of the infamous Nero. It romps through seventy years of Roman history, all told through the eyes of an elderly Claudius as he records the history of his extraordinary family. The BBC miniseries stars Derek Jacobi as our eponymous hero, although he doesn’t seem like much of one. Born with a club foot and terrible stammer, Claudius is alternatively mocked and ignored by his extended family. Claudius soon realizes the value of being underestimated, and as he grows, he hides his intelligence behind his physical disabilities and avoids politics as best he can. But in this family, even the ultimate underdog can’t hide forever. I, Claudius features Brian Blessed as Augustus and Siân Phillips as Livia, the manipulative, conniving matriarch and Augustus’ wife. Indeed, this tale is as much Livia’s story as it is Claudius’. Livia is the true power behind the throne, delicately manipulating with a rumor here and a little poison there. She is the center of the wheel, turning her family’s fortunes and fate at will. Livia desperately wants her son, Tiberius, to follow in Augustus’ footsteps and become the next emperor of Rome. The problems with that grand plan? One: Tiberius is her son from an earlier marriage, not Augustus’ biological son. Two: Augustus has grandsons by his biological daughter, Julia, who precede Tiberius when it comes to inheriting. Three: Tiberius himself has no interest in being emperor – he’s a soldier through and through. But these minor impediments certainly don’t phase the mighty Livia. Despite her sins, Phillips manages to make you understand, if perhaps not sympathize with, Livia’s single-minded pursuit of power. There is a deeper motivation here beyond mere money and influence. The miniseries also includes a young Patrick Stewart (with hair!) as Sejanus, the corrupt and power-hungry leader of the Praetorian Guard, and John Hurt in one of his most magnificently terrifying roles as the mad emperor, Caligula. Bribery, corruption, murder, poison, blackmail, adultery, madness, lust – I, Claudius has it all. Check the WRL catalog for I, Claudius. Everyone knows about the McDonald’s hot coffee lawsuit in the mid-90s. Or at least, they think they know. Hot Coffee, a recent HBO documentary, strives to tell the truth about this case, and other civil lawsuits, that have been deemed “frivolous” and the impact of tort reform on the United States’ civil justice system. Sound kinda boring? I thought so too – at first. As well Ms. Liebeck’s case, the documentary goes on to discuss Colin Gourley’s malpractice lawsuit and caps on damages; the prosecution of Mississippi Justice Oliver Diaz and the buying of judicial elections; Jamie Leigh Jones v. Halliburton Co. and the growing pervasiveness of mandatory arbitration. The documentary concludes by examining how the plague of mandatory arbitration is swiftly erasing many individuals’ ability to take complaints to the courts. Own a credit card? Cell phone? Well, if you do, it’s almost certain you have signed away your right to a civil trial in your contract and if you ever have a serious complaint and feel entitled to claiming damages, you will be forced into secret mandatory arbitration with an arbitrator who – wait for it – has been chosen by the corporation itself! Hot Coffee is an eye-opening, jaw-dropping documentary that exposes how corporations have spent millions on a propaganda campaign to distort the average American’s view of these civil lawsuits. This documentary will forever change what you think you know about “frivolous lawsuits” – in reality, what you’ve been told by corporations and doctors afraid of being sued. The way that the individual’s rights have been infringed upon by mandatory arbitration, caps on damages, and corporate campaign contributions is unacceptable. Hot Coffee shows how access to the courts has been blocked by greed, corruption, and the power of special interests and how the U.S. civil justice system has been changed – maybe forever. Check the WRL catalog for Hot Coffee. I first came across Camilla Läckberg when she was mentioned in an article on Scandinavian mystery writers in Romantic Times. I became even more intrigued when I read the review on the front of The Ice Princess from Val McDermid –“Heart-stopping and heart-warming.” “Heart-warming?” That certainly made me pause. After all, “heartwarming” is not an adjective I expect to read describing a murder mystery, and a Scandinavian mystery at that, which tend to be characterized by their wintry settings and bleak atmosphere. But after finishing this book, I couldn’t help but agree with Ms. McDermid’s review. The two protagonists and primary investigators –Erica Falck, a biography writer, and Patrik Hedström, a local policeman – both grew up in the sleepy fishing village of Fjällbacka, Sweden. This village, overrun by visitors from Stockholm in the summer, desolate and empty during the bleak winter months, has definitely seen better days. The Ice Princess is definitely not a “cozy” mystery, but the blossoming relationship between Erica and Patrik, as well as the various familial bonds that lace the narrative, help to temper the sadness and gloom surrounding the murder. Following the sudden death of her parents, Erica returns to her hometown and soon discovers the body of a beloved childhood friend, Alexandra Wijkner, frozen in her bathtub. As a biography writer, Erica is seized with the impulse to write about her one-time, enigmatic friend and the reasons that could drive a woman who seemed to have everything to commit suicide. But, as any seasoned mystery reader will guess, Alexandra’s apparent suicide is only the beginning. As Erica begins to delve into Alexandra’s past, Patrik begins to investigate his own suspicions surrounding her death. A picture of the victim begins to build. Alex was beautiful, blonde, icy, and remote – everything this reader wants in a Swedish noir mystery. And, like any good victim, she was hiding a deep, dark secret that somehow seems to involve the tragic figure of the town drunk, Anders Nilsson. No one in the village can understand how these two disparate figures were connected, least of all Erica and Patrik. The Ice Princess features tragic childhood secrets, mysterious disappearances, and bribery, all set against the backdrop of the bleak Scandinavian winter. Fans of The Girl with the Dragon Tattoo will enjoy this mystery, although it focuses less on social issues and politics, and is more in the vein of a traditional mystery. The novel has a wide cast of characters, and the author continually introduces new characters to keep her readers guessing. We meet Erica’s family, her ex-boyfriend, the victim’s family, and the motley crew of police officers at the local police station, including Mellberg, the pompous, slimy, self-obsessed monster of a police chief, who is both hilarious and horrendous at the same time. This is a great winter read, perfect for a cold night, curled up with a blanket. Camilla Läckberg is one of Sweden’s bestselling crime novelists and The Ice Princess was her first novel. If you gobble this one up as quickly as I did, never fear! WRL has two more in the series, which have been translated into English. Check the WRL catalog for The Ice Princess. The Hour, a recent BBC period drama, has flown somewhat under the radar (at least when compared with the roaring success of a series like Downton Abbey), and it wasn’t until a colleague recommended it that I even became aware of the series. Set in 1956 at the BBC Lime Grove Studios in London, it follows the launch of an hour-long weekly current affairs television show, simply titled, The Hour. The six-part miniseries stars Romola Garai as Bel Rowley, the independent (female!) producer of the show; Ben Whishaw (the new “Q” in Skyfall and star of Cloud Atlas) as her best friend, Freddie Lyon, a brilliant and passionate reporter; and Dominic West as the charming and well-connected anchorman, Hector Madden. This is the opportunity Bel and Freddie have been waiting years for – to be a part of a new breed of investigative news program that could change the face of news at the BBC. But a chance meeting with a childhood friend and a hushed-up murder on the Underground thrusts Freddie right into the middle of a deadly Cold War conspiracy and the silent war being waged between MI6 and the KGB. As Freddie begins to investigate, the trio becomes embroiled in a tangled web of politics, ambition, and romance. But a controversial breaking story could spell the end for the program, just as it is beginning. And in amongst all the secrets and spy-games, I even learned a fair amount about the Suez crisis in 1956 between Britain, France, Egypt, and Israel (something I wasn’t even particularly aware of prior to the show), as well as the rules regulating broadcasters at the time. To my surprise, there used to be a fourteen-day gag rule that prohibited news programs from debating or analyzing anything discussed in the Houses of Parliament until two weeks after the event. But our intrepid team manages to find a neat way around this limit to free speech. The Hour is lushly produced with period sets and costumes and is a wonderful piece of escapist drama. It is full of quick-witted repartee and fast-paced dialogue. The love triangle at the heart of the story is nicely balanced by the Ian Fleming-esque intrigue that seems to follow Freddie wherever he goes. Best description? It’s like HBO’s The Newsroom crossed with John Le Carré’s Tinker Tailor Soldier Spy. Check the WRL catalog for The Hour. The Song of Achilles was the first book I read this year, and come December, there’s a pretty good chance I may say it was the best book I read in 2013. I studied Classics at university, and of course the Iliad was required reading. But I often had to admit, always a little sheepishly, that I was never really a big fan of the epic. I could never enjoy the long lists of ships, war prizes, heroes, and descriptions of violent, bloody deaths that fans of Quentin Tarantino would find familiar – and least of all the sulking, brutish, prideful Achilles. I always found myself cheering for the tragic figure of Hector instead – the prince of Troy who fights not for glory or everlasting fame, but to defend his home and family. Ms. Miller begins her story with Patroclus, a sullen, awkward prince exiled from his home to the kingdom of Phthia, ruled by king Peleus. Patroclus quickly falls under the spell of the bright-eyed, golden-haired prince, Achilles. Achilles is intrigued by Patroclus and the two become inseparable. When Achilles is sent away to become a student of the ancient, learned centaur, Chiron, Patroclus cannot bear to be separated from his closest, and only, friend; and so he runs away from the palace and joins Achilles on the slopes of Mount Pelion. The author handles their blossoming affection and romance very delicately and reverently. She does not beat around the bush in her explanation of Achilles’ and Patroclus’ relationship as many more prudish historians and translators have been wont to do over the centuries. Moreover, Ms. Miller gives her readers an opportunity to better understand Achilles’ motives for going to war and provides believable explanations where Homer remains silent. She fleshes out both his and Patroclus’ characters and gives added dimensions to a character, who, in the Iliad, is little more than the sum of his anger (μηνιν…ουλομενην) and pride. One of the difficulties facing any modern adapter of Homer and his heroic epics is the omnipresence of divinities. Do you, as an author, ignore them, thereby stripping the stories of their heart and soul? Or do you portray the heroes living in a magical world, thereby making the story unrealistic to modern readers and difficult to reconcile with the grim, visceral effects of war? Well, Ms. Miller simply takes the gods in her stride. At the beginning of the novel, she deals with them matter-of-factly in Patroclus’ child-voice. It reminded me very much of how a child today might explain the existence of Santa Claus and his elves. He does not think twice about their existence, and consequently, neither do you. She writes with clear, evocative prose and I would agree with the Guardian’s review that the prose is better than almost all the so-called poetic translations of Homer I have ever read. The Song of Achilles is a must-read for any lovers of historical fiction, and Classicists too, whether they are fans of the Iliad or not. Check the WRL catalog for The Song of Achilles. At sixteen, Millicent Graves has always known that she’s merely a cog in her father’s machine of Marrying Well. The only daughter of nouveau riche parents, whose family had the temerity to make a fortune from–wait for it–canned goods, she has known practically from birth that she must marry a peer with an exalted title, or frankly, any title at all. Enter the Earl of Fitzhugh, only nineteen, and the sudden recipient of a title accompanied by overwhelming debt, who needs to marry an heiress in order to save his estate from bankruptcy. Cue the marriage of convenience. But unfortunately for Fitz, he’s already in love with someone else. And unfortunately for Millie, who’s been raised to be “sensible” about love and marriage, she falls in love with Fitz almost at first sight. Knowing how unhappy Fitz is to be selling himself on the marriage mart and losing all hope of being with his beloved, Millie makes a bold proposition. Partly to protect her heart and partly due to her youth, she suggests they wait a few years before consummating the marriage. Neither one is eager for children, and so the heartbroken Fitz readily agrees to her proposal. As the years pass, the work of saving a failing estate and reviving a stagnating business unites them, and the marriage, the greatest challenge either has known, begins to define them both. To their surprise, a deep and considerate friendship develops. But can their friendship ever turn to love? Ravishing the Heiress is the second book in Sherry Thomas’ new series, which began with Beguiling the Beauty, featuring Fitz’s elder sister. (This novel is definitely worth a read too–not only because it is our first introduction to Millie and Fitz, but also because the story takes place in the unusual setting of a transatlantic liner crossing from New York to Southampton.) While at first glance, this book may just seem like another a marriage of convenience story, it is also a coming-of-age story for Millie and Fitz. It is about the importance of friendship in building the foundation for a meaningful relationship–a welcome antidote to books like the Fifty Shades series. And most importantly, it’s about the old adage that life is what happens when you are making other plans. Thanks to Thomas’ skill, Millie is kept from being a milksop–by her quiet strength, her sensible nature, and her sincere, patient love for Fitz. Whilst Millie certainly longs for Fitz to reciprocate her feelings, she realizes how unlikely this is and chooses instead to focus on other things, such as her affectionate relationships with her sisters-in-law, her thriving business, and the genuine friendship she and Fitz share. She is a character you can admire. And since this is a romance, it’s no great spoiler for me to say that at the triumphant end, we finally see Millie’s patience and faithfulness rewarded as it should be. And boy, is the ending worth the wait! Even though I stayed up late to reach the end, I wasn’t quite ready to let Millie and Fitz go and am now waiting impatiently for the next installment in the series, Tempting the Bride, in which they are sure to make an appearance.